With Michael Boley's spear, the narrative for the entire Cowboys season changed. And while it won't save Wade Phillips' job, it will allow Dallas fans to coast through another season and offseason of self-delusion. Tony Romo will get an MRI for his fractured clavicle today, but the only question is whether he's done for the year, or if he'll return in December just in time to lead the team to their fourth win. It's a lost season, but it was lost long before last night. It had just been disguised by close losses and gaudy YPG stats. It's a team that can't pressure the opposing quarterback, or protect its own. A team that doesn't have a prayer in man-to-man coverage. A poorly-disciplined team that took foolish penalties and made backbreaking turnovers. Basically, the Cowboys didn't have anything but skill players. So the Cowboys weren't a team prepared to compete. We were starting to see that, through five-and-a-quarter games. That's a big pill to swallow for a fanbase expecting an elite team, and being fed by their owner the line about a home Super Bowl. As the season progressed, and the Cowboys proved just not good enough, that big pill would have turned into a giant suppository. But no longer! The story of the 2010 (and not 2010-2011) Cowboys isn't about a useless secondary, or poor pass protection, or anything boring but fatal like that. It's now about their star quarterback going down in week seven, and the team depending on Jon Kitna. 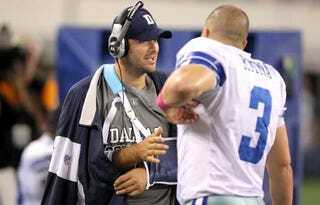 Now despite what Roy Williams says, Jon Kitna's not as good as Romo. No one's thinking playoffs now, or even expecting a win each week. When 31 other fanbases inevitably derive joy from their failure, Cowboys fans can point to the caprices of fate. As time passes and memory fades, they'll point to Romo's injury as the sole reason they didn't claim their Super Bowl birthright. They'll even start to believe it. Denial can be the only way to make it next September when your season is effectively over in October.